In the past couple of years, I’ve had the opportunity to speak at a few SQLSaturdays, and presented to my local chapter, IndyPASS, a couple of times. I gained a new experience a few weeks ago, one that I had no idea would be so timely. I presented one of my sessions to YooperPASS, a new chapter in the upper peninsula of Michigan. This session was my first online session for PASS. I’ve presented online before at Salesforce, but that was to an internal audience. This was a new session, presented for the first time, to a bunch of strangers. Fortunately, the YooperPASS folks are very welcoming, and I think it went very well. I mentioned this was timely, though, didn’t I? Well, that’s because I’ll be giving my second ever PASS virtual session on Thursday, the 20th. 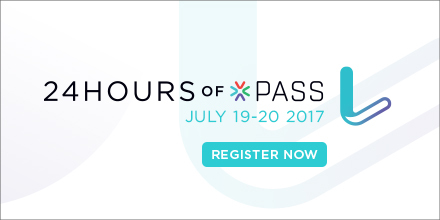 I’m a part of the 24 Hours of PASS: Summit Preview 2017! The same session I gave to YooperPASS, A Guided Tour of the SqlClient Namespace, will also be part of this webinar event. Because I’ll be presenting this session to a much wider audience now, I’d like to expand on my approach to this session. First, I call it a “Guided Tour” because I’m cherry-picking those areas that I think deserve some special attention. A more comprehensive session would be impractical. So I had to cut things off somewhere. What made the cut are four topics that have valuable specific takeaways. A good technical session should give attendees something today they can put into practice tomorrow. I’d like to think I accomplished that with these topics. Second, my choice of topics also gives me a chance to get across a broader message about how to scale ADO.NET code. Performance is always a focus of mine, and my experience has taught me that there is frequently a trade-off between application code and the database. One piece of code may perform better than another under a microscope, but its effect on overall system performance may actually be worse. In this session, I try to draw attention to this trade-off. Finally, this is my attempt at an introductory session on an often-overlooked topic. Let’s face it, ADO.NET has been around a while. Because of that, I think the information available on it is inconsistent. StackOverflow didn’t exist until long after ADO.NET was introduced. Yes, there are some fine older resources on ADO.NET, but enterprises have changed a lot since many of them were written. Most current resources focus on Entity Framework, which is arguably just an abstraction layer over ADO.NET. So my session is intended to close the gap. Anyway, I’m looking forward to being a part of this 24 Hours of PASS. If you tune into my hour, I hope it’s worth your time. This entry was posted in Uncategorized and tagged c-sharp, dot-net, pass. Bookmark the permalink.